According to the European Convention on Human Rights…..
1. “Everyone has the right to freedom of expression. this right shall include freedom to hold opinions and to receive and impart information and ideas without interference by public authority and regardless of frontiers. This article shall not prevent States from requiring the licensing of broadcasting, television or cinema enterprises. This has been the source of much misunderstanding, confusion and offence over the years – never more so than today in the United Kingdom of 2011. Fuelled by sensationalist media hype and hatemongering racists playing the ‘freedom of speech’ card many people are far from clear about what article 10 really does and does not say. In fact the right to express oneself, however offensive others may find your statements is a basic and fundamental right of a democratic state. European citizens can say anything they like unless there’s a specific law against it. To illustrate…. It’s OK to criticize the Bible, however many Christians might be offended by your words. It’s even OK to criticize Christians themselves for advocating such a primitive, discriminatory and barbaric set of rules if that’s what you want to do but it’s not OK to advocate hurting Christians or burning their churches. That’s because advocating harm breaches ‘incitement’ and ‘public order’ laws and also article 9 of the ECHR as previously discussed. Say what you like – that’s expressing an opinion but don’t imagine that it’s OK to go further and interfere with the rights of other people to live as they choose to. The reverse of this is that the Christian churchgoers who are protected by Article 10 are also bound by it. That’s why, for example, they find themselves in court for discrimination when they treat gay and lesbian hotel guests differently or attempt to ban women from holding positions of authority among their ranks. The law may not agree with the tenets of Christianity (try owning slaves on religious grounds or stoning children for playing on a Sunday for example and see what happens) but that doesn’t mean that it will allow anyone to be abused for their belief. Their actions are another thing altogether too. I’ve intentionally focused upon Christians here to make a point by the way. So far as I know not a single one of my Christian friends would advocate keeping slaves or stoning children. Nor would they advocate eternal damnation for drinking both beer and wine at the same setting and most of them don’t particularly care about other people’s sexuality. But their holy book (the bible) is very clear on these issues and not really very nice about them. The fact is that it would be ridiculous to condemn all Christians because of a few barely read passages in Leviticus or a throwaway line in one of St. Paul’s epistles. People are much more complicated than that – and on the whole much better. That’s why most (alas not all) Christians I know are genuinely nice people. Consequently it’s OK to criticize the idea of Christianity but not to discriminate against the individuals themselves. The same, incidentally is true for all religious beliefs. It’s fine to criticise religious ideas – I do it all the time. In fact I just did in the preceding few paragraphs. 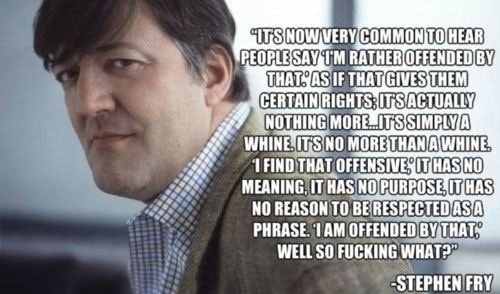 And guess what – no matter how many people might be offended by that paragraph I have a perfect right to say it. Without the legal right to express our different opinions and views society could never develop, diversity would become narrower and narrower and our nation would revert to the sort of enforced conformity of Puritanism or some fascistic police state. But we can’t go around stirring up trouble and we can’t be racist because there are specific laws preventing that sort of rabble rousing. Enter the English Defence League. What they do demonstrate, at least sometimes, is a genuine concern over the welfare of citizens who may find themselves unfairly judged by religious courts. They’d be more credible if they also opposed Christian and Jewish religious courts instead of focussing purely upon Islam but that’s unlikely to happen. After all their beef isn’t really with Islam – it’s with people who aren’t white skinned. They just use religious extremism as a convenient cover. But let’s apply article 10 to their behaviour and see what we come up with. Article 10 supports the right of the EDL to protest peacefully and to put their point across. Article 10 supports the EDL in criticising Islam as well as in debating the relative merits of Islam as opposed to other systems of morality. Article 10 does not support the EDL in attacking Muslims, in setting fire to Mosques or in inciting violence and civil unrest. That’s why so many EDL members have found themselves in court recently and why so many of them, including their leader, Stephen Yaxley Lennon, have been banned by the courts from attending EDL demonstrations. Freedom of expression is one thing – attacks against other citizens and blatant discrimination are quite another. “The right to freedom of expression in Article 10 is not an absolute right. It is a qualified right. An interesting and recent ECtHR case involved a Turkish journalist who criticised Islam but who stopped short of attacking or inciting violence against Muslims themselves. I reproduce the summary (together with weblink) below. In 1992 Erdoğan Aydin Tatlav, a journalist living in Istanbul, published a five volume book under the title Islamiyet Gerçeği (The Reality of Islam). In the first volume of the book he criticised Islam as a religion legitimising social injuries portraying them as “God’s will”. Following a complaint at the occasion of the fifth edition of the book in 1996, the journalist was prosecuted for publishing a work designed to defile one of the religions (art. 175 Crim. Code). He was sentenced to one year’s imprisonment, which was converted into a fine. Before the ECtHR Tatlav complained that this conviction had been in breach of Article 10 of the Convention, referring to the right of freedom of expression “without interference by public authority”. Essentially, the Court evaluated whether the interference in the applicant’s right could be legitimised for the protection of the morals and the rights of others as “necessary in a democratic society”. 4). The Court did not exclude that Muslims could nonetheless feel offended by the caustic commentary on their religion, but this was not considered a sufficient reason to legitimise the criminal conviction of the author of the book. The Court also took account of the fact that although the book had first been published in 1992, no proceedings had been instituted until 1996, when the fifth edition was published. It was only following a complaint by an individual that proceedings had been instituted against the journalist. With regard the punishment imposed on Tatlav, the Court is of the opinion that a criminal conviction involving, moreover, the risk of a custodial sentence, could have the effect of discouraging authors and editors from publishing opinions about religion that were not conformist and could impede the protection of pluralism, which is indispensable for the healthy development of a democratic society. the interference by the Turkish authorities disproportionate to the aims pursued.